« We make, but thou art the creating core. 1) it is an allegory that “the make believe kermis (circus) scene Vanity Fair, this world of human folly, will be overthrown by its own vices, which are but agents of Gods will”(Adriaan Barnouw). Hermogenes , falling upside down, appears to be “done in”. As a precaution, Tolnay suggests, Bruegel disguised this event as a theatrical scene (jugglers, performers, acrobats, carnival characters, and the sideshow announcement hanging like a flag from the back wall left center). It may be noted that dimly through the window, just to the left of the flagstaff, appear several faces of typical Flemish people, looking on, as if in amusement. This entry was posted on Sunday, March 6th, 2011 at 10:11 pm and is filed under art & books, faith. You can follow any responses to this entry through the RSS 2.0 feed. You can leave a response, or trackback from your own site. I just wanted to mention a little more background on what this wonderful engraving depicts. The various demons are performing tricks that were commonly associated with magicians (often called conjurors) of the time. Hermogenes himself is shown performing the cups and balls, probably the most quintessential of all magic tricks. 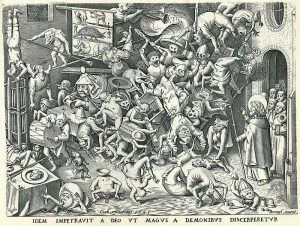 In the lower right, one of the grotesque figures is also performing the same trick. A puppet, trick knife and spike (apparently penetrating hand and tongue respectively), acrobatics, contortionism, and even the famous illusion called Decolation of John the Baptist (the beheading scene in the left foreground) are shown. Most of the magic tricks shown here can be found in Reginald Scot’s book Discoverie of Witchcraft, which was published in 1584 in England. The tricks would have been familiar to people all over Europe who had seen magicians perform. I doubt that Breughel would have been taken in by the tricks, being such a very good observer (he had to be in order to be the artist he was), but it is interesting that his choice of depiction for a sorcerer included street magic tricks of the basest sort. Perhaps that was also a subtle commentary either on Hermogenes or on the gullibility of the authorities who would choose to condone the persecution or even death of a conjurer. As an amateur magician and fan of Breughel, this is one of my favorite works. Hello Patrick, and thank you for the fascinating insight. It wasn’t until you mentioned this that I took a new look at some of the depictions…especially the head on the table, and chuckled at the “magicians” perspective, and how it sheds new light. Thank you for sharing this. I suppose there is a line somewhere (however thin) that would delineate between harmless tricks, and harmful contacts of the other world in true “witchcraft”. In reality though – pharmakeia, which is the Greek root of our word witchcraft – has more to do with improper, and sorcery like drug use…so I scratch my head as to why these “tricks” would be in a book on witchcraft…if they are as harmless as they appear. 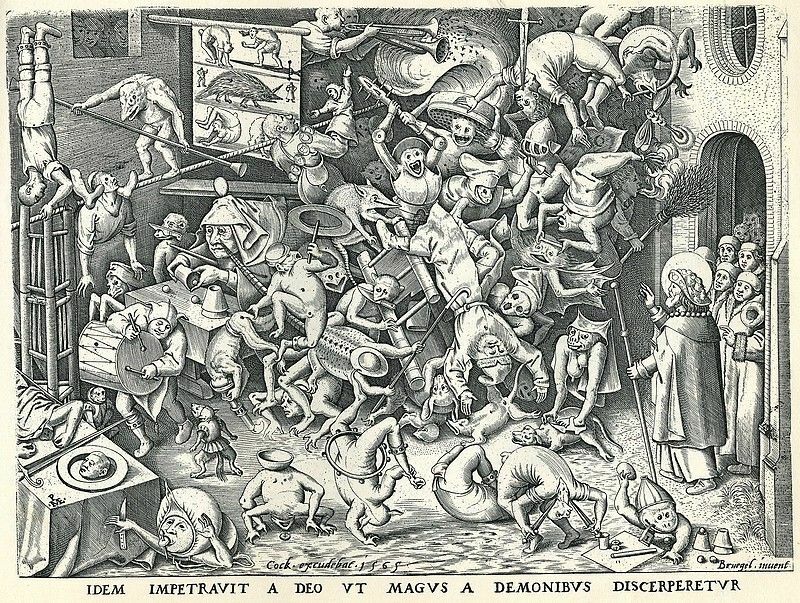 just happened upon this….I am an artist and amateur magician… there is reason to believe that brueghel was making a distinction between the “real” sorcerer, Hermogenes, who is getting his just deserts and the entertainer on the left who is merely pretending to have supernatural power. It might also serve as a warning to those who seek to deceive that real evil might tempt one over into the dark side with all its unintended consequences!